Use below information at your own risk. We take absolutely no responsibility for any damage accured to your PC while attempting this procedure! EDID files for our panels are available in Support/Sources section on our website. We ship our HDMI converters with pre-programmed EDID data for our standard LCD panels (1280×800 for single-LVDS, and 1920×1200 for dual-LVDS converter). 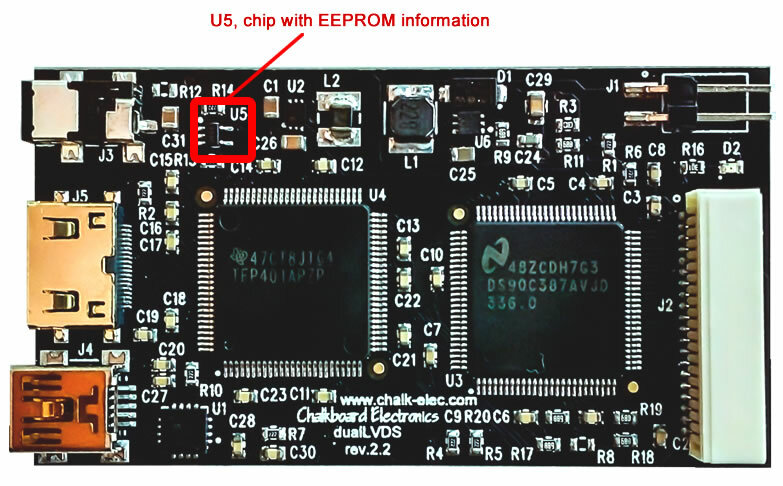 If you want to use it with different LCD panel and different resolution, then you should update EDID information stored in EEPROM chip. Fortunately, this is not difficult procedure, and it will not require any special hardware tools. All you need is Linux powered PC or board (like RasPi) with HDMI output and keyboard to type in terminal commands. So, run Linux, open Terminal, connect our HDMI converter to HDMI output of PC, and power it with external power supply. Others cables are not required. 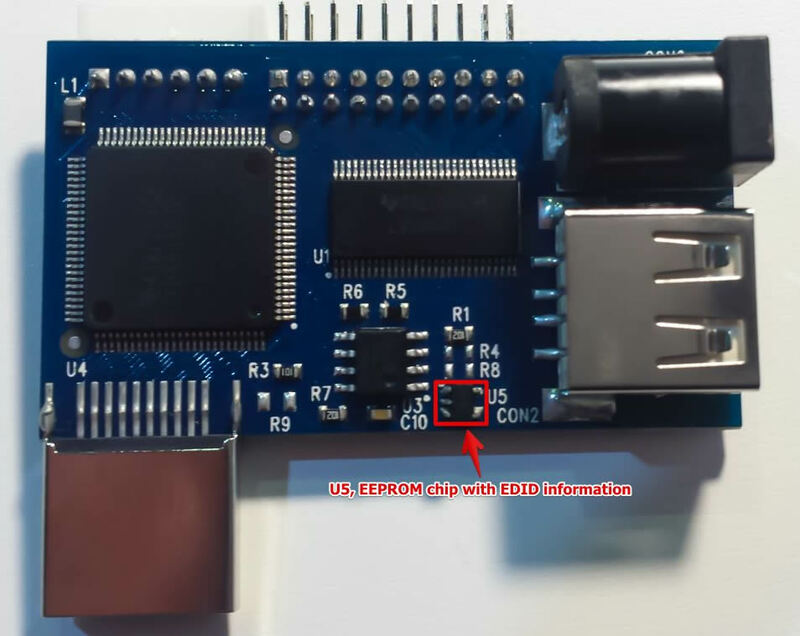 Now we know I2C bus number and can program another EDID information to our HDMI adapter. But be careful to state correct bus number on the next step. Better check twice output on previous step, then check once again. If you state wrong I2C bus number, you can accidentally overwrite another I2C EEPROM with wrong data (like EDID information of main LCD panel of your notebook). It was a long time since my last post, and I had one reason for this – big business customers came to us with large orders after they found us, and we were not ready for the big show. Big qty orders, tough deadlines and everyday online technical support. It was tough challenge for us. We tried to reserve at least some of panels from each batch to refill our online web-shop and support our community, but these panels were sold in several hours, and we again got tons of emails with requests for stock. After couple months like this we saw only one solution – to upgrade our whole SMT production line for higher grade equipment, hire additional staff, and to automate production planning and order processing tasks. We managed to find new big office for production, sign rent, and started renovation. At the same time we ordered new SMT equipment: semi-automatic stencil printer with optical alignment, high-speed PnP from Autotronik with dual heads, new oven with nitrogen process, and PCB cleaning machines. They will arrive next Tuesday. Equipment is so big and heavy, that we have to use crane to hoist to 2nd floor, and will dismantle window to move it in. Setup and calibration will take around 1 week, after that we will have high-speed production. Also, we work to automate our process handling and shipping procedures. Our goal is to reduce time to 1-2 hours from receiving order to shipping it to you. Yes, we are working to improve all the time. Our current 10″ LG panel (1280×800) is obsolete (got EOL status last December). We can continue to supply it only to customers who has signed supply contract with us. We have new 10″ IPS panel with resolution 1366×768, black frame, 10 fingers multi-touch with USB interface. Good news is that this panel will have integrated HDMI board like our 7″, with LVDS scaler, HDMI audio extract, and USB HID touch driver. Thus, you will be able to use it hassle-free with virtually any hardware platform. No more kernel hacks, no more resolution limitations! We also finished design of FullHD 10″ panel with capacitive touch. It will be available for order end of February. Next is small-size cheap LCD solution based on FT800 chip. Welcome, Arduino and Launchpad lovers! You will get complete 4.3″ LCD with touchscreen, audio, and SPI/I2C interface. Finally, we are starting to offer capacitive touchscreens with USB interfaces for those who has already own LCD, and just need touch interface.